Here’s a remarkable assemblage of MGM players gathered on a Brigadoon soundstage at the twilight of Hollywood’s studio dominance. You can check the name captions to identify these faces (a few on one side were clipped off, but only a few --- this was a big image to scan!). 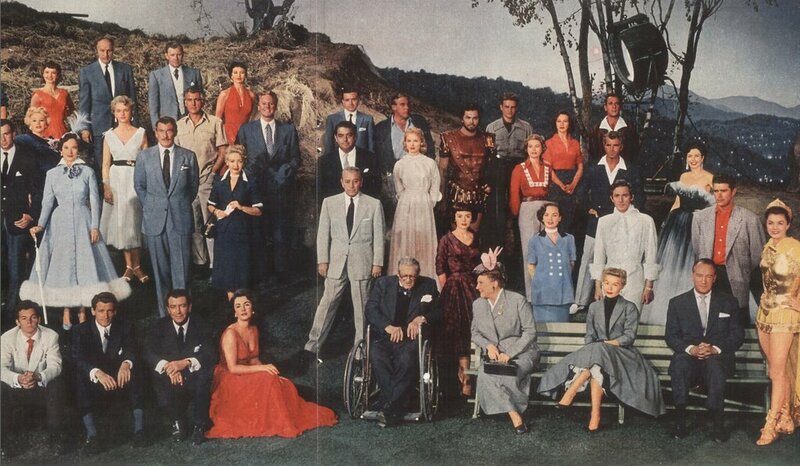 It was probably made around the beginning of 1954, as films in production (judging by costumes and actors present) include Deep In My Heart, Executive Suite, Green Fire, The Last Time I Saw Paris, Rogue Cop, Jupiter’s Darling, and no doubt more. Metro wanted to emphasize their status as a healthy, bustling concern, even in the midst of studio decline. This may have been the last such gathering to take place on the lot, unless someone knows of a group photo from a later date. I can't read the type in the caption, even when clicking on it to enlarge it. Can you tell us who is in the photo? I assume the man in the wheelchair is Barrymore. Who is the woman beside him with the large flower in her hat? What was whited out on the caption? The woman next to Barrymore is Helen Traubel. Is Ann Blyth (in between a brunette Donna Reed and a costumed Micheal Wilding) pregnant? Interesting that they'd include her in a shot, if so.